You already know that you should wear sunscreen to protect your skin from the sun’s UV rays. But did you know that you should also be protecting your hair? Too much sun can dry out hair, fade its colour, and cause breakage. 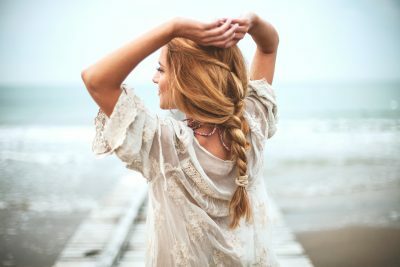 To keep hair healthy, follow these tips and tricks for summer hair protection and repair even in the summer sun. How Does Sun-Damaged Hair Happen? The sun’s UVA and UVB rays damage the hair cuticle, which protects the inner part of the hair strand. Without this protective layer, hair easily loses its natural moisture. Thus, skipping sun protection for hair can result in rough, dry and brittle hair by the time that autumn weather rolls around. The strong summer sun can also have an effect on your hair colour, especially if you dye your hair. Brown hair tends to get a warmer tone, while blonde hair lightens, and red hair can become dull and faded. The best thing you can do to protect your hair is just to avoid the sun! Stay out of the sun between 10am and 3pm, when UV rays are the most powerful. If hats aren’t for you, you actually can make your own leave-in conditioning spray that will provide some sun protection for hair. Add two teaspoons of SPF 30 sunscreen, a cup of water, and a few drops of essential oil to a spray bottle. Shake thoroughly to mix, and lightly spritz onto your hair whenever you’re going to be outside. Like sunscreen for your skin, you’ll want to re-apply hair sunscreen regularly for maximum protection. If you’re in a pinch, apply a leave-in conditioner to wet hair and style hair in a bun using a scrunchie. Conditioner actually can help create a barrier that provides some protection from the sun while keeping hair moisturized. Infuse much-needed nutrients into dry, brittle hair by making a DIY hair mask. See two recipes for DIY hair masks or try this easy mask: In a bowl, mix 1 egg, ½ avocado, 1 tablespoon of coconut oil, and ½ teaspoon of honey. Apply to hair and allow to sit for 30 minutes. Then wash out with a gentle shampoo like Viviscal Gorgeous Growth Densifying Shampoo. A good conditioner will add moisture to dry, sun-damaged hair. Viviscal Gorgeous Growth Densifying Conditioner is formulated to hydrate dry hair, plus it smooths the hair cuticle with keratin. For extra hydration, apply Viviscal Conditioner to hair before hitting the beach or the gym. The heat will help the conditioner to penetrate the hair shaft more deeply. Use a colour-treatment product to revive your hair colour after sun damage. Blondes will want to use a conditioning treatment with purple pigments to remove yellow tones, while brunettes will want to use a gloss that eliminates red tones. Women want to know what makes hair thicker and how to thicken hair fast, but the truth is that there is no miracle treatment that will truly turn thinning hair into thick, luscious locks overnight. There are a lot of different products and promises out there, but most of them are just trying to make a quick buck. You can make hair thicker fast, but it’s important to understand how and why. There’s a myth that with continued use, some hair loss products can actually cause permanent new hair follicles to form. This just isn’t true. You were born with all the hair follicles you’ll ever have. People born with more hair follicles will have thicker, denser hair. It’s not necessarily fair, it’s just genetics. Some topical drugs can stimulate follicles to produce hair artificially. But if you stop applying the drugs, all your new hair growth will fall out. You will have to apply these drugs forever in order to maintain your hair growth. So what can I use to actually make my hair thicker? If you want your hair to actually be thicker, rather than just temporarily appearing plumper, you need to promote growth from the existing follicles. You can do this in a few ways, but it starts with your diet and making sure that it nourishes follicles in line with your hair growth cycle. A diet rich in Biotin (Vitamin B7), Niacin (Vitamin B3), iron, zinc, vitamin C and marine protein will help nourish thick and healthy hair strands. Or for a simpler solution, try Viviscal healthy hair growth supplements. 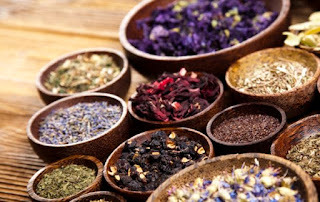 Natural home remedies can also be added to a supplement routine to help thicken and nourish hair. One of the best home remedies and our personal favourite is coconut oil. It’s rich with antioxidants that improve scalp health, add volume and shine, and support the look of overall hair growth. Massage a teaspoon of coconut oil into your scalp with gentle pressure for 10 minutes, three times a week. The essential nutrients will penetrate the hair shaft from the outside, making hair look healthy and shiny. Others like peppermint oil and lavender oil are also great for stimulating the scalp to deliver more oxygen and nutrients to your follicles, creating a better environment for hair growth. It’s possible to thicken your hair but stay away from any product that says it will create new hair follicles. If any of your friends want to know what makes your hair grow faster and thicker, tell them that nourishing hair follicles from within will help increase the thickness of your hair. No matter which treatment option you opt for, the only way you’ll see results is through a good diet and a consistent routine. Consider what all that hair colour, styling products and heat styling does to models' hair throughout the six-week fashion week runway season. 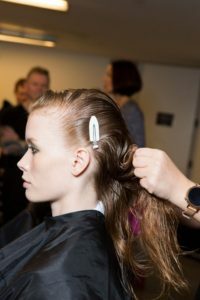 Here are 10 secrets from New York fashion week pros that keep runway models from permanently damaging runway-ready hair. 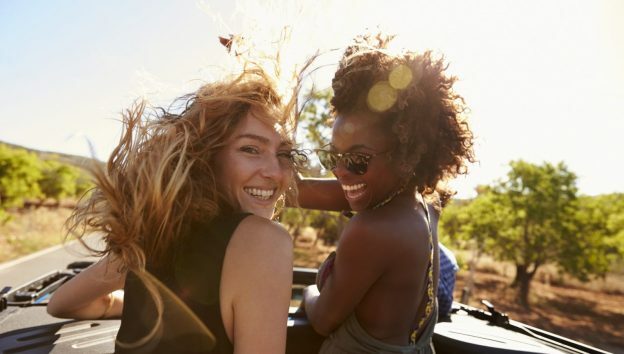 Holli Smith, a previous lead NYFW hairstylist for Creatures of the Wind, says that while hair masks and deep conditioners are a must, there’s another important approach to healthy hair that not many seem to know about. “The one thing that all these models do for their hair but don’t necessarily talk much about is their use of the supplement Viviscal,” Smith says. “It strengthens the hair so that it’s not prone to breakage and it helps the new hair grow back in stronger and healthier.” Nourish follicles with the complete hair growth supplement with marine extracts, biotin, vitamin C and iron. “I put avocado oil into my conditioner every day to add extra moisture into my hair to give it an unbelievable shine,” explained one hairstylist talking backstage at a Jason Wu show. Not only is avocado oil ultra-moisturising for your hair, it has makeup removing powers as well (yes, even in mascara). 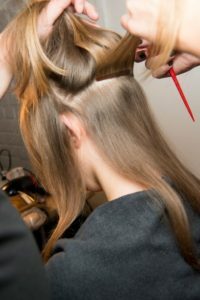 Lead hairstylist Jeanie Syfu has said backstage at Marissa Webb that every model must detangle her hair with extra care. “Take all the elastics and bobby pins out of your hair and hop in the shower without brushing first. Wet your hair, put a deep densifying conditioner on it and wait until the hair is soft enough to run your fingers through — this means the products have disintegrated from your hair. Then, do a full shampoo and the second set of conditioning to fully detox the hair.” This tip works best for girls who use a ton of hair products, especially in those tight, super hair-sprayed hairdos (think wedding hair). Keep in mind that brushing your styled hair before showering can cause major breakage since the hair is dried out and tangled, so simply jumping in the shower first is your best bet. 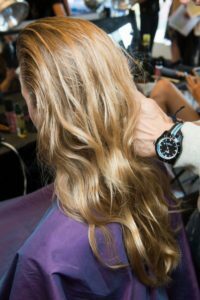 When asked about repairing hair post-NYFW, most hairstylists were focused on re-hydrating damaged strands. 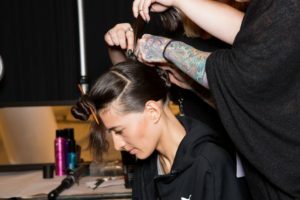 However, one hairstylist backstage at Nicole Miller had another issue she wanted to address: “There’s typically a ton of buildup in the models’ hair after all the products they’ve used for each show. So, I always recommend rinsing their hair with apple cider vinegar after the week is finished to remove gunky product residue and restore the hair to its natural pH level.” As a bonus, apple cider vinegar seems to have acne-clearing abilities too, so it’s a skin and hair win-win. 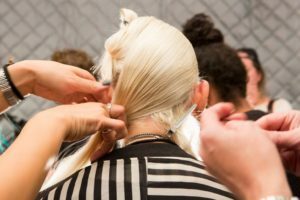 “After fashion week, a lot of models tend to have dry, damaged hair from all the hot tools we’ve been using,” said hairstylist Ale Bonilla backstage at Christian Siriano. “My best suggestion for them is to first coat your hair with a reparative hair oil, pop a damp towel into the microwave until it’s warm, and then wrap the hair up in the towel for about a half-hour.” After the treatment, Bonilla recommends shampooing the excess oil out and using conditioner as usual. That’s not all — Anthony says that the outside of your hair can be pumped full of vitamins too. “Hair salons have vitamin-enriched treatments that can strengthen the hair by opening up the hair shaft and pumping proteins into the strand to rebuild it,” he says. Don’t be turned off at the idea of opening the hair shaft of already-damaged hair. Anthony says that these ingredients will create a smooth, healthy look that will be worth it in the end. Ask your local salon for treatments that specifically boost the look of hair health and skip styling treatments like keratin, which can lead to more damage. 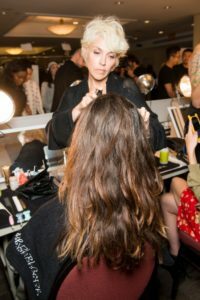 When all is said and done post-fashion-week, Anthony Cole at the Christian Siriano show, advises models to set aside a few hours one night to do an entire hair revival treatment. “Always start your hair recovery night with a clarifying shampoo,” says Cole. “You want to get rid of all the residue from products that were used in the hair, then add extreme moisture via a hair mask or deep conditioning product, and then end it with a penetrative protein treatment”. Yes, there is an ultimate DIY hair recovery recipe and Davide Marinelli, a hairstylist backstage at Jenny Packham has shared it. “First, combine a large avocado and five drops of jojoba oil or almond oil into a bowl, mix it until you get a creamy, rich texture, and set it aside,” he explains. “Then, add a tablespoon of baking soda into a colour-safe clarifying shampoo that’s sulfate-free and hop in the shower to exfoliate only the scalp — not the hair.” Afterwards, Davide recommends towel-drying your hair to where it’s only slightly damp (not wet) before applying the avocado treatment. The drier the hair is, the more it’s going to absorb the formula, because wet hair can actually dilute it. “Take an old white t-shirt, dampen it with warm water, and wrap the avocado-covered hair with the t-shirt into a bun,” says Davide. After 15 minutes, you can rinse out the avocado and shampoo your hair as you normally would. When wearing an overnight hair mask, do not simply put a towel down on your pillow and hope the product won’t make too much of a mess on the clean sheets. According to Kenna, lead hairstylist at Liberine, this is actually one of the biggest mistakes we can make when trying to revive damaged hair. “An overnight hair mask is the best thing you can do for your hair after it’s been damaged; however, if you sleep on a towel, it’ll simply absorb the moisture right out of your hair,” Kenna explains. Instead of a towel, Kenna recommends wearing a silk scarf on your head to lock the moisture into your hair during the night. Or try a silk pillowcase that was specially designed to protect hair and skin from overnight damage. You can read the original article on www.popsugar.com. Women need the right balance of not only estrogen but testosterone as well. If a woman has too much testosterone, it can lead to hair growth on her face, neck or chest. And it can lead to thinning hair on her head or even hair loss. So does DHT cause hair loss in women? Yes, excess DHT hormone in women and hair loss is rather common. DHT hormone hair loss can be tempered, however. Supplements can be enormously beneficial in this regard. Those with high DHT levels should opt for a supplement that contains DHT inhibitors or other anti-androgens, which block the cell membranes from accepting excess levels of DHT. Supplements paired with exercise and a diet rich in antioxidants can help reduce DHT levels. Additionally, lowering stress can have positive effects. What is the link between hair loss and hormonal imbalance? There is a profound link between hormones and hair loss in women, especially during already significant transitional life stages, such as post-pregnancy or menopause. Many women also experience hair loss due to natural hormonal imbalances. With the right treatments, such as healthy hair growth supplements and lifestyle changes, women can help mitigate the effects of hormonal imbalances that can lead to hair loss and promote existing hair growth. Getting stressed out about hair loss can pull you into a cycle of anxiety that makes everything worse. Asking yourself “why does my hair keep falling out so much?” often leads you to point the finger at everything from stress to pregnancy. The truth is that there are many factors that can lead to excess shedding. However, worrying about them does not help. It’s time to stop losing your cool and read our top tips to stop hair loss. Follow these simple steps you can take right now. If you feel like you shed hair excessively in the shower, there are a few simple things you can do to when seeking how to stop hair from falling out naturally, in addition to supplementing your diet. Use a gentle shampoo that is free from SLS/SLES. This protects against irritation of the scalp, which can cause inflammation and inhibit the healthy promotion of hair growth. Use a moisturising conditioner predominantly derived from natural ingredients. Dry hair can become brittle, so ensuring that it remains hydrated helps to protect against breakage. Avoid wrapping your hair in a large coarse towel after showering. This can lead to friction causing breakage. This helps to reduce stress levels and keep cortisol levels under control. Read more about cortisol levels and hair loss. Again, this is essential for looking and feeling our best. A good diet goes a long way to promote healthy hair growth, and vitamin deficiencies do not make us happy or healthy. Banish the laptop from the bedroom and invest in some curtains that black out the room completely. This will help to improve the quality of your sleep, which in turn helps to make you feel less stressed. Despite the diversity of hair loss causes, there is one universal truth about hair loss: you can improve the health of your hair by making changes to your nutritional intake. In order to fuel the hair growth cycle, your body requires vitamins, minerals and other essential nutrients to nourish hair follicles from within. Most of these ingredients are available in a variety of foods, but many people’s diets are not varied enough to ensure an adequate supply. This lack of variation is usually due to our busy 21st-century lives, getting in the way of good old-fashioned food preparation. A simple solution is to supplement your diet with Viviscal Extra Strength, which contains a specialized blend of nutrients to reduce shedding and promote hair growth. This type of hair loss is a little different, as it is usually caused by hormonal changes. All of the aforementioned points about nutrition still apply, of course, but it is important to recognize that pregnancy sends our bodies on a roller coaster of hormones. If you are experiencing post-pregnancy hair loss, then this is usually a completely natural cycle and your hair will return to normal, given time. If you are feeling self-conscious about thinning hair, try Viviscal Hair Filler Fibers. These microfibers are electrostatically charged to stick to your existing hair and can be matched to your natural colour. They are weather-resistant and can be easily washed out with shampoo. We hope that these tips help you to see how to stop hair from falling out naturally or with the help of a few clinically tested and drug-free products. Aside from pregnancy (obviously! ), the above tips offer guidance on how men can stop hair from falling out as well as women. The causes of thinning hair in women and men are diverse. Male pattern baldness or androgenetic alopecia is widespread and well documented, but trying to understand what causes thinning hair in women can often be less clear-cut. Before we discuss some common thinning hair causes, it is important to acknowledge that hair loss can sometimes occur as a result of an underlying health condition. If you are worried that the cause of thinning hair in your case could be related to another health issue, you should get in touch with your doctor. As part of a healthy hair growth cycle, hair follicles grow and then fall, shedding an average of 100 strands per day. But if you see more hair fall than this, you may be experiencing excessive hair shedding. To protect against some causes of hair thinning, it is necessary to provide your body with the vitamins, minerals and proteins it needs to nourish hair from within. Healthy, nourished hair is less likely to be shed. Prevent one of the common causes of hair thinning: nutritional deficiencies. Supplying yourself with important nutrients for healthy hair growth can help to prolong the anagen (growing) phase of the hair growth cycle. While the requisite nutrients are present in some foods, getting a good balance in your diet can be challenging to maintain. For a simpler solution, Viviscal Maximum Strength hair supplements is a targeted dietary supplement, which was specially created to fight this common cause of thinning hair in women. This comprehensive solution is packed full of vitamins, minerals and the unique marine complex AminoMar®. Super simple to use and 100% drug-free, this approach can help tackle the nutritional deficiency cause of thinning hair without the need for invasive treatments or surgery. It is not uncommon for women and men to experience excess hair shedding due to hormonal changes. For example, it is clear that the onset of hormonal shifts, namely of DHT, is what causes male pattern baldness. However, did you know that hormonal factors can be the root of what causes hair to thin among women too? Pregnant women undergo huge bodily changes during and after pregnancy, and one side effect of post-pregnancy can be hair loss. Similarly, coming off your birth control pill can cause a sudden hormonal swing, and has been known to be a cause of hair thinning in women. Finally, the elephant in the room is stress. The experience of both emotional and physical stress can cause hair to thin. Sometimes the cause of this stress is acute, whereas at other times there are complex underlying reasons. If you are worried about stress causing hair to thin, then contact your healthcare provider to discuss the possible causes. At this point in your understanding of hair loss, you probably already have accepted the fact that there will always be something “new.” Different things work for different people, and there are many natural remedies for female hair loss. Here are the best natural remedies for hair loss. Wild-caught fish – A great source of omega-3 fatty acids which decrease inflammation and help prevent a dry scalp. We recommend salmon and tuna. 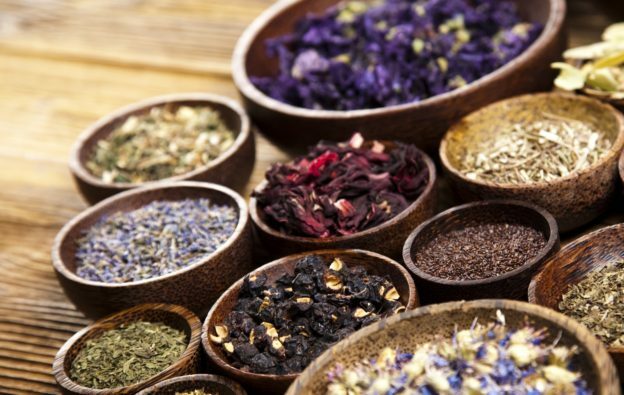 Green tea – Detoxifies your body and contains antioxidants that promote hair growth. Also plays a role in stopping testosterone from turning into DHT, the hormone behind hair loss. Pumpkin seeds – Very high in zinc, a key ingredient for an overall healthy head of hair. Low zinc has been linked to hypothyroidism, a contributor to hair loss. Trans fats – There’s nothing good about trans fats. They increase inflammation and the production of DHT. One of the easiest ways to keep them down is by only cooking with healthy fats like olive oil or coconut oil. Sugar – Too much sugar can imbalance your hormones. Changing levels of hormones can lead to a rise in DHT and inflammation. Processed foods – There is no natural remedy for female hair loss that includes processed foods. They’re loaded with trans fats, sugar and sodium. You know that they’re bad for you, and they’re especially bad if you’re trying to fight hair loss. Keep to the outside lanes at the grocery store (i.e. where the most wholesome foods are) whenever possible. Hair growth supplements are a great way to support your diet, especially when you can find everything you need in a daily vitamin. B-Vitamins – B vitamins like biotin and niacin (vitamin B3) attach to your hair follicles and make them thicker, naturally. They also support your adrenal glands, and even help reduce stress! Zinc – Low zinc levels and hair loss often go hand in hand. Many experts believe that low zinc causes a deterioration of the hair follicle. Saw Palmetto – A natural DHT blocker with years of promising research behind it. Fish oil – One of the most well-documented natural remedies to reduce inflammation and thicken hair with its high levels of omega-3 fatty acids. Keratin – Keratin is a structural protein that makes up 90% of your hair. When it’s in your shampoo, it will penetrate your hair shaft and fill in the cracks where there’s damage. Vitamin C – Vitamin C helps build up collagen and improves your body’s ability to absorb iron which keeps your hairs strong and healthy. We highly recommend our Viviscal Gorgeous Growth Densifying Shampoo. It contains a proprietary complex called Ana:Tel™ that has been clinically tested to promote thicker looking hair, as well as the other ingredients for hair growth like keratin, zinc and biotin. Make sure you follow a good washing routine. Essential oils – One of our favourite natural remedies for hair loss, essential oils promote hair growth by keeping the scalp clean and improving blood circulation. Our favourites are horsetail plant oil and rosemary oil. Massage them into your scalp a couple times per week to see best results. Stay hydrated – Make sure you’re drinking enough water! You are probably tired of hearing this, but it’s important. When your body is dehydrated, your follicles are not going to grow nearly as well as they should. Reduce stress – Make sure you’re getting enough sleep and schedule yourself plenty of “me-time.” Incorporate massages and other natural remedies to reduce stress, which will help improve your overall hair health. Remember that it’s up to you to combat hair loss. If you are noticing any irregular shedding or your hair is not feeling as thick and soft as usual, take the time to figure out what could be causing it. 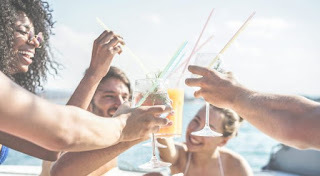 Alcohol is a diuretic, meaning that it decreases the production of the hormone that causes the body to absorb water. This can result in increased urination and, ultimately, dehydration. Chronic dehydration can cause dry, brittle hair and parched skin. 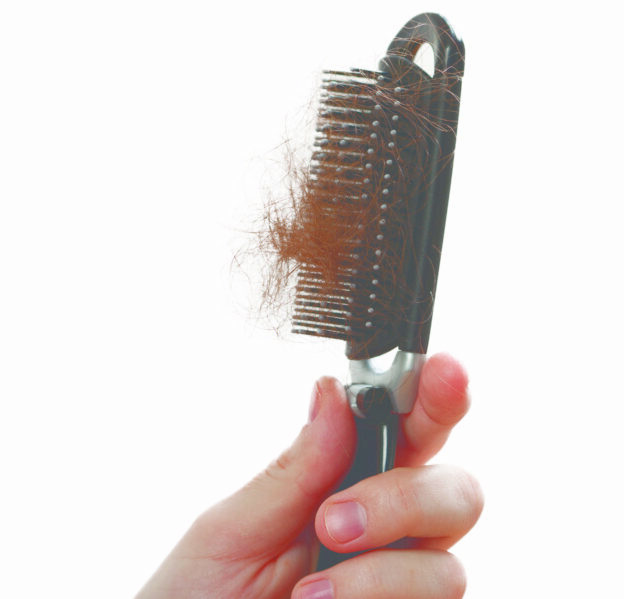 Brittle hair is more likely to break off, resulting in thinning hair. Heavy drinking can cause lower levels of zinc and iron, both of which are necessary for healthy hair growth. Low levels of iron can lead to “telogen effluvium”, a condition in which an unusual amount of hair follicles move from the growing phase to the resting phase of the hair growth cycle, leading to thinning hair. Insufficient zinc levels can weaken the protein structure of your hair, resulting in breakage and hair loss. Beer is perhaps the only “good” alcohol for hair since beer is rich in the trace mineral silicon. In fact, beer is the richest source of silicon in the average diet. Silicon is thought to increase blood flow to the scalp, resulting in healthy hair. No need to go overboard, however. One small beer contains 10 mg of silicon, which is usually enough to promote healthy hair and nails.